Gantt diagrams show tasks or operations in a time oriented way. Hence a timescale is a key feature of any Gantt diagram. So what are important aspects of a timescale? In this blog post, you can learn more about the topic "timescale in Gantt diagram". We adress this topic by focusing a code sample of our Java Gantt control which is centered around timescale options and capabilities. VARCHART JGantt is a Java Gantt control. In the just released version 3.1 a new Java code sample provides you with a plethora of timescale-related features and options for different resolutions and requirements. The sample is structured in four sections and lets you dive into the world of time scales. Depending on what time span your schedule is focused on – short-term scheduling on minute-basis, or long-term planning on a monthly basis – in the Gantt control there are more than 40 predefined time scale types for your choice. Besides the predefined ribbon stripes, you can use a dynamic timescale in VARCHART JGantt. 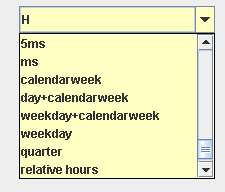 Dynamic timescales are important when you want to zoom into your Gantt diagram. Zooming by mouse wheel should be a common feature for a timescale, but when the ribbon stripes automatically changes subject to the resolution this is like the cherry on the cake. The dynamic time scale function uses a selection of the predefined ribbon stripes from seconds to years and VARCHART JGantt will select the best matching one according to the current resolution. The dynamic timescale is one of nine key features you should look for when evaluating a Java Gantt diagram control. Maybe none of the predefined ribbon stripes fits to your timescale requirement. For example you want to visualize minus values on the left side of the "time now" line. Choose one of the predefined ribbon stripes in VARCHART JGantt and modify it. The past and the future – how to visualize best? Use two timescale sections, with two different colors and maybe two different resolutions. In VARCHART JGantt you can even define three sections and create a magnifying glass. Want to play around with effects of timescales? Download the free trial version of VARCHART JGantt and choose the sample “EnhanceTimeScale”. We are curious about your feedback.